(Chapter Titles) Carbon-Carbon Bond Forming Reactions. Oxidations. Reductions. Synthesis of Heterocycles. Protecting Groups. Useful Synthetic Preparations. Reviews. AuthorIndex. 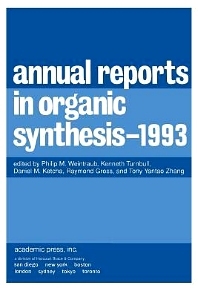 The Journal of the American Chemical Society has aptly described this publication as an"aid to the harassed organic chemist who cannot keep up with the never-diminishing stream of new primary literature"and hails it"an outstandingly good buy." Wright State University, Dayton, Ohio, U.S.A.
Marion Merrell Dow Research Institute, Cincinnati, Ohio, U.S.A.